Here's a bird that isn't afraid to admit how low-end he is. There are a lot of bad Flappy Bird clones out there - but this is one of the first games to actually admit its awfulness. 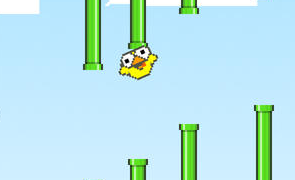 Crappy Bird has you guiding a bird through a series of pipes, having you do all the work while he lazily rolls around. Believe it or not, it's a fun game. Help Crappy deal with his dilemma with these tips. How do the controls work in Crappy Bird? The main character, Crappy Bird, rolls along the ground to start. It's up to you to get him through the pipes by tapping him. When you first tap him, he'll launch into the air but won't go very high. You must tap the screen multiple times to give him good distance into the air, which you'll need to do in order to clear higher pipes. Find a good method when it comes to tapping. Stick with rapid taps in order to help him get high and low. He'll sail through the pipes with ease. Watch out, though. If he comes into contact with any of the pipes, it's game over. Do I need to worry about hitting the ground in Crappy Bird? Nope. In fact, sometimes it's an advantage, as some lower pipes will require you to descend to the ground and hop over them. Don't worry about keeping him in the air. Just make sure he gets through the pipes. Can I compete with friends in Crappy Bird? Yes. Like other Flappy Bird clones, Crappy Bird comes with an integrated Game Center-powered leaderboard, where you can compare your best scores with others. At first, it may take a while to move up in the ranks - our first try was 4, very low compared to the Cool Bird score of 25 - but with practice, you'll get there, and you can show others just how Crappy you are. Does Crappy Bird get difficult over time? Yes, but in the same way that Flappy Bird and other games do. The challenge is being able to navigate through a series of pipes over time to continue increasing your high score. With enough practice, though, you'll get the hang of the gameplay and sail through those pipes. Granted, it doesn't help that Crappy Bird is such a lazy bum. That's just how Crappy he is, we guess. What else can you tell me about Crappy Bird? Check the messages that appear on the title screen. They are often hilarious, pointing out how bad Crappy Bird is, or asking questions, like what's really in those pipes. Come to think of it, we're a little afraid to find out.